CIE is in partnership with NUS to bring you the NUS extra card! The card is ONLY £12 for an entire year and is valid for 12 months from the first day you purchase. 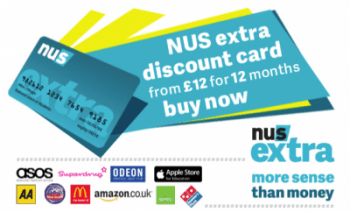 Apply for your NUS card now and start saving from today! For more discounts and offers, visit NUS Extra. The National Union of Students of the United Kingdom (NUS) is a confederation of students’ unions in the United Kingdom. Since 1922, NUS has worked tirelessly on behalf of students and students’ unions. Around 600 students’ unions are in membership, accounting for more than 95 per cent of all higher and further education unions in the UK. The NUS represents over seven million students across the UK, providing excellent benefits and helpful research and information an promotes, defends and extends the rights of students and develop and champion strong students’ unions. Note: Please keep your Unique Learner Number (ULN) and Centre Number handy when you apply.